Nice & Easy - Plus the Price is Right! My friend gave me this as I was saying I needed something for my brows - I find pencils clumpy and awkward to use. I have very light brows and you can hardly see them, this kits was perfect for defining them and giving them shape. I couldn't be without it when wearing my make up now. The packaging is nice and compact, the palette contains a little mirror as well as a double ended application brush. One thing I love about E.L.F products in general is that the palettes have a tight closing mechanism, and so far I haven't found my products open and getting bashed about by my other make up bag goodies. I found the one side of the brush perfect to apply the darker shaded cream as it's slanted and not straight. This makes it so easy to use. If you're unsure on the suitability of these instead of pencils, at only £3.75 for a variety of different shades you can't go wrong as a started set to practice with. 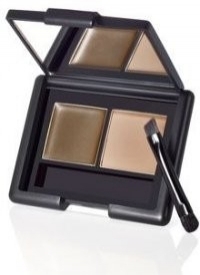 A lovely little kit, great for touching up the brows and making them look tidy & defined!